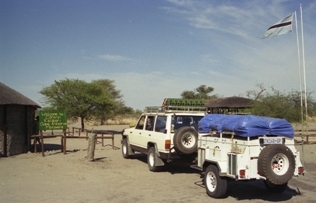 A maximum of three (3) vehicles per site. Bed Levy fee of P 10.00 per person per day to be settled with (SKL Group of Camps). Park entry fee of P120.00 per person per day. To be settled direct with the Department of Wildlife and National Parks. • No fences are around the sites – please stay within the campgrounds. • Wild animals can enter the campgrounds – Be alert. • No telephone or internet is available. • For you & others to experience the best is, NOT to make noise between 20:00-0600 please!! Island enjoy heavy concentration of wildlife in the dry season. Third Bridge offers much more of the wilderness experience than most of Southern African camping grounds with unspoiled wilderness and top destination. Currently, a boat station development is underway to provide boat activities and transfers to Gcudikwa and Gxhobega lagoons where the heronry of migratory birds are located. The boat station will further provide means of transport for provision of camping facilities at the Wilderness sites namely; Gxhobega and Gcudikwa 1& 2. 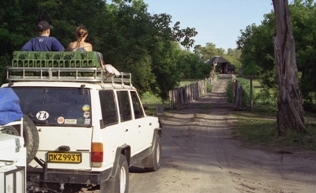 Activities: boat cruises, transfers to the Wilderness Sites, Game drives, transfer from Xakanaxa airstrip & Maun transfers. Related services – mini bar & restaurant, dry goods outlet. All kids under 16 years are charged at 50% per day. Please Note all Trailers will be charged P50 per day. Park fees and vehicle fees are to be paid with the department of wildlife. 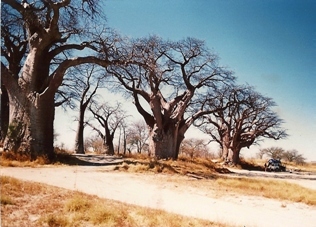 It covers 2500km2 and was proclaimed in1970, later extended to its present size including Baines baobab. Nxai National Park is located on the Northern fringe of the Makgadikgadi basin and includes Nxai pan, an ancient lake bed that was once part of ancient Lake Makgadikgadi. 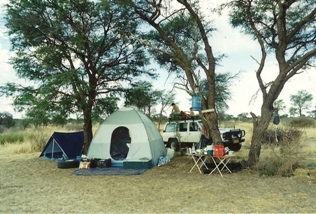 Nxai Pan National Park Consists of series of fossils pans acacia tress on islands that form shady spots for the animals to rest during hot weather. South Camp Campsite is situated not far from the second entrance gate in a well shaded area. They were named after the famous painter and explorer Thomas Baines in 1862.These group of Baobabs are known as the sleeping sisters. Baines Baobab overlooks Kaudia Camp Pan on the South side of the Nxai South camp. Although the pans at Baines Baobab are dry for most of the year, the area is transformed into a massive sheet of water during rainy season and the abundance water beds creating spectacles of great beauty. It can be reached by Nxai Pan Turn off. Facilities: Shower & Pit latrine – no water. What you bring, you take out. 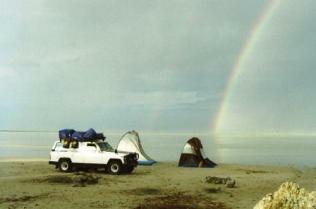 Lekhubu Pan (Just wilderness campsite, have no facilities). All these campsites are maintained and managed by Bigfoot Tours. They are kept clean and neat at all times. 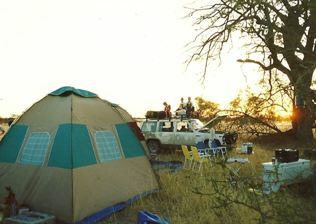 Each campsite can take up to 6 people with a maximum of 3 vehicles. Borehole water(which is provided at the main entrance gate (can be cold/hot). Visitors are encouraged to bring their own drinking water.